MasterChef everyday has a very simple recipe for potato and celeriac mash. Unusually for me, I didn’t feel the need to adapt it and make my own version. Put the potato and celeriac into a pan of salted cold water, bring to the boil. Reduce heat and simmer for about 15 minutes until the veggies are soft. Drain thoroughly, then mash together with the cream and butter. Season to taste. This was easy and absolutely delicious! It’s a lovely change from mashed spuds. I pretty much followed John Torode’s recipe from MasterChef everyday . Peel and dice a celeriac and a large potato. Put into cold salted water. Bring to the boil and let it simmer for 15 minutes or so until it’s soft. Drain and mash. Add a glug of double cream and a daud of butter. Delicious! Sadly that book seems to be out of print now, although you can buy second-hand copies. On the other hand, you can find it free on Google Books. Here’s a link to the entire MasterChef recipe for venison steaks with celeriac mash and berry sauce. Alternatively, you could try Tom Aiken’s celeriac mash from his Tom Aiken’s Cooking book. I haven’t tried that one yet as I only recently bought the book, but I’m keen to get started on what looks like an exciting addition to my cookbook collection. Celeriac can also be substituted for potato in other ways. I had been experimenting with a neep dauphinoise earlier and had a spare bit of celeriac so I tried making a celeriac dauphinoise too while I was at it. As I expected, it was lovely. River Cottage Veg Every Day has a good recipe for potato dauphinoise so I used that and simply scaled it down and substituted the potato with celeriac. Preheat the oven to 160°C/Gas Mark 3. Rub a gratin dish liberally with the butter. Peel the potatoes and slice them thinly, either with a sharp knife or a mandoline. In a large bowl, whisk together the cream, garlic and nutmeg and season well with salt and pepper. Toss the potatoes in the creamy mixture, then layer them in the gratin dish, spreading them as flat and evenly as you can. Pour over any remaining cream. 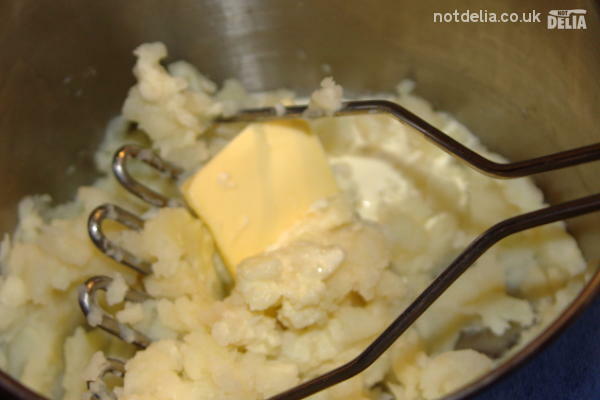 Bake for 1–1 hours, pressing down with a spatula every 15 minutes or so to compress the potatoes and stop them drying out. 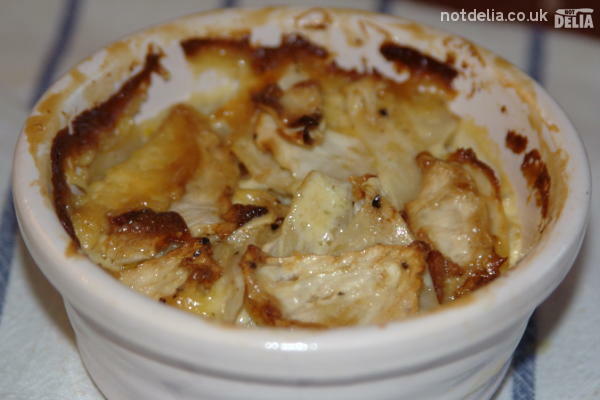 The gratin is ready when the top is golden and bubbling and the potatoes are tender. You may want to turn the oven up to 190–200°C (Gas Mark 5 or 6) for the last 5 minutes to achieve a bit of extra bubbling crispness. Leave to stand for 5 minutes or so before serving. Either of these dishes could be served with any fairly robust meat. They’d go well with a beef stew or a pan-fried steak or venison.